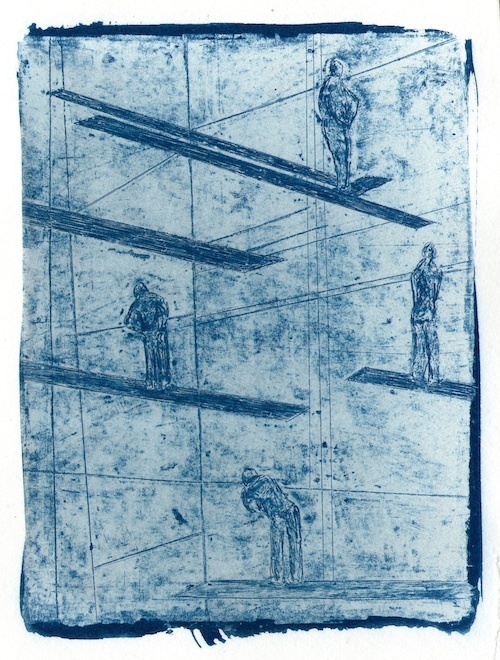 Her particular fascination and passion for the possibilities that traditional methods hold, have kept her interested in the bridge between blue-print (ciano-tipia) and other forms o printmaking. She has devised multiple ways of generating matrixes for this photo-sensitive printing technique that resemble closely the results obtained with xylo/calco/litho-graphies. She is continually exploring this method and finding unconventional ways to revisit what established and finding new life or strategies to manoeuvre the technique and render it as flexible as the possibilities it allows. Since 2016 Irina has been curating and hosting the yearly international printmaking exposium GRAPHICALL, in 4bid gallery Amsterdam, exhibiting Dutch and International artists working in the medium of printmaking alongside hosting a series of workshops and a symposium with guest speakers from the field of contemporary printmaking. With this initiative she promotes a discussion on what printmaking is today and encourages a reconsideration of the graphic mediums as versatile and multifaceted.